Facts about Polar Bears, "Scientific name for Polar Bear is Ursus maritimus". Polar Bears are closely related to the black bears of Canada. Polar bears live primarily on seal pups of the ringed and bearded seals. They will eat harp seals, hooded sales, baby walruses and scavenge from whale carcasses. Polar Bears spend their time on the edge of the ocean and ice floes, since this is where their prey, marine mammals, are located. "Polar Bear" means maritime bear in Latin. It is entirely carnivorous, whereas the brown bear will eat berries, insects and some plant material. In fact, polar bears are the largest land based carnivores in the world. Polar bears are excellent swimmers. They can swim up to five miles per hour (8 Km/Ph). 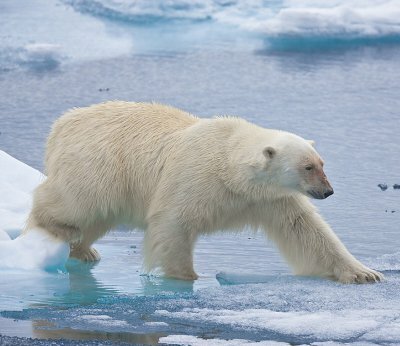 Polar Bears have been found as far out as two hundred miles (322 Km)from the ice’s edge. They can run up to four miles per hour (6.4 Km/Ph). Polar bears have white fur, but the skin underneath is black. Male Polar Bear are much larger than the females. Both males and females have very thick fur, even on their feet. The Polar Bear have a thick layer of fat that provides both buoyancy when swimming and protective insulation. Polar bears have a longer neck and narrower skull that aids their swimming. The Polar Bears broad, flat feet give them better traction on the ice and act like paddles when they are swimming. Male polar bears reach eight feet (2.43 meters) in length and 1600 pounds (725.74 kg). Female Polar Bear are around a thousand pounds (453.6 kg) and seven feet (2.13 meters) long. There are several confirmed cases of polar bear and grizzly bear hybrids, but these are rare cases, since brown bears won’t move out onto the ice to hunt seals. The polar bear is not going extinct due to global warming. In fact, the number of polar bears has risen in the past fifty years. Male polar bears do not hibernate. Breeding females may hibernate, but non-breeding females will not hibernate. Pregnant polar bears build up fat reserves to sustain them and their cubs through the winter. They build dens in October or November and give birth to them in December or January. Polar bear cubs are about a foot long and weigh roughly a pound at birth. The cubs will be 20 to 30 pounds (9.07 to 13.60 kg) by spring, when they emerge in March or April. The mother hibernates in the den while the cubs nurse, saving her energy so that her fat reserves turn primarily into milk for the cubs. The cubs stay with the mother for around two years. Female polar bears usually have two cubs per litter, though triplets have been seen around Hudson Bay. Females only have five litters in a lifetime, if they live that long. Polar bears can live as long as 30 years in the wild. Polar bears are the apex predator of their environment. A few fossil finds reveal the occasional polar bear attack by a shark, but their only true predator is man. Polar bears are hunted by native peoples for food and fur. Since hunting by humans is restricted, polar bears have little fear of humans. In fact, they will often seek out human trash dumps to scavenge for meat and garbage.